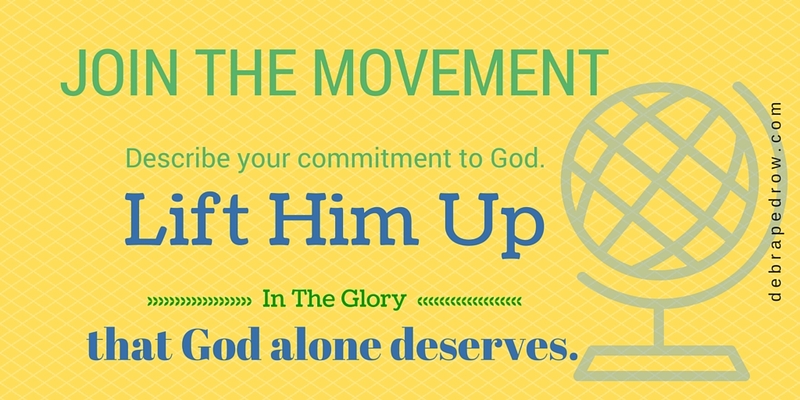 Lift Him Up has praised, revered, glorified and lifted up our Creator’s title name – God, since August of 2014. To do any less in our everyday-God-given-lives, is blaspheme. I invite you now to “Break The Chain” of misusing His name! 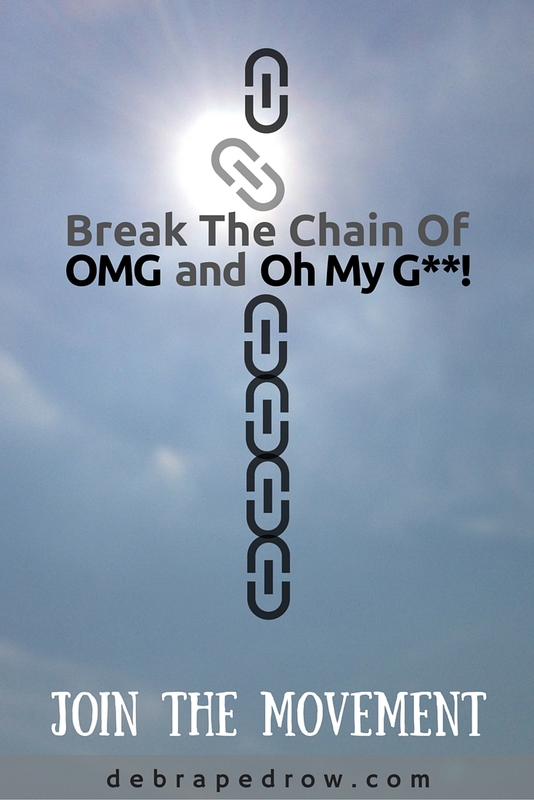 “Break The Chain” is a format where you post your personal commitment to refrain from the misuse of OMG! and Oh My G**! Here is the place you can talk about any misuse of God’s name you have seen or heard, and how you feel about it. Perhaps you can share how you or someone you know broke free of this habit. We need to stand up for God’s name! If not you then who? Who will stand up for God’s commands? Who will stand up for God to preserve the holiness of His name and break the chain of passing on OMGs to BFFs as they LOL? Simply clicking the delete button on specific texts will shine light on your soul. Commit – Stopping all usage of OMG! and Oh My G**! shows respect for who God is. This action can lead others to follow your example. Change – Converting your irreverent communication skills to words offering exact description shows you care how others perceive you. No one likes a disrespectful approach. Surrender – Turning over any past sinful misuse of God’s name to Him who gave us voice in the first place, demonstrates believing in Him for salvation. Leave your comment in the space below. Perhaps you want to share a misuse you heard, witnessed, or read. There are a lot of crazy examples out there. I saw tees advertising a city using OMG! as a line. I bought a purse with OMG stitched on the outside, to show as an example when I speak. There was a food store that dangled large signs from the ceiling professing OMG what great deals they have. Let’s honor God properly, not with inappropriate slang that society deems acceptable. Demonstrating the actions of Commit, Change and Surrender, encourages us to remember where we stand on truth – God’s name must be kept holy. Persistently embracing these actions helps us continue the good habit of respecting His title name G-O-D.
I’m going to start off this page with a personal story. – Where are the irreverent offenses of speaking God’s name in vain taking place? Everywhere people talk. My husband and I visited a different church this morning. As we walked to the front door of church, there was a family following behind us. Their first words, which I couldn’t help but over hear were “Oh My G**! blah blah blah…” The need is now, for us to remember who He is. Please join the movement. I love this movement. I am committing to break the chain of saying OM*. I will share this on social media! Hi Debra. You may know this, but if not I thought it would interest you. Back when Crocodile Hunter was popular, so was the term he often used, “Crikey.” It caught on with me too – until I discovered for an Aussie its an expression derived from “Christ.” That put an end to it immediately for me. Also the Brit term “bloody” appears to have its roots in the blood of Christ on the Cross, so its another that is no better. There seems to be a lack of clarity on this one, but it seems questionable enough that people of faith should avoid it. It helps to know the derivations of the words we use before we use them, and I am making an effort to be more careful about the words I use now. Scott, I did enjoy the Crocodile Hunter movies, but did not know that about the “Crikey” word. I never hear “Crikey” or “bloody” used in my area so I have not given it thought. But I do thank you for sharing. History is so very important to help us better understand the third commandment. Thank you for this article! I have difficulty getting Christians to understand that they are misusing God’s name when it is used for any and every expression (fear, happy, they like something, excited about something, anger, and every other expression and as part of every sentence and conversation – even toddlers repeat it). I have heard many pastors’ sermons (well-known, internationally known, and local – radio/TV/local church) and their conversations using God’s name in unglorified ways – during their expressions – not during glory to God or honoring God by representing Him appropriately. How can we explain to the non-Christian world that it is dishonoring God when pastors and Christians use His name in the same way that they, the non-Christians use His name? The worldly entities’ names/titles aren’t used in ‘unglorified’ ways! I must admit that I sometimes do not remain quiet and tell the offender that they just cursed God when they should say thank you for the gift they just received or for the other “happy” occasions that they curse God by using His name as an inappropriate expression. Thank you for your comment, Ann. Yes, the name title “God” not only tells us He is the supreme being, it represents all that He is. His loving character, His awesome power, His gifts of mercy and grace to us. To use God in an unholy manner, no matter our intent is mad or glad, is to misrepresent and blasphemy Him. Thank you, Debra. It’s about time that someone stood up and spoke the truth on the very important issue of holding God’s name in reverence. Although I do not remember ever speaking these words, I often find myself wounded as I hear them from the mouths of some of those closest to me. Some of these claim to walk close to Jesus, but at times I have to wonder. Not that we don’t all have our faults. But this one is such an easy one for thinking people to notice and correct. I think that the use of this sorry phrase and its abbreviated format show intellectual laziness and a grave lack of both reverence and creativity in personal communication. My desire to avoid this even prompts me to delete any email that comes to my inbox when the ugly abbreviation shows up in the subject box. I figure that if that’s the way these merchants and others are going to begin their communications, they already have nothing worth saying. Truly we can do better, and I sure would like to see more of us doing just that. May God bless you for this timely post. P.S. Isn’t there a Bible verse somewhere that says that God will not hold them guiltless who use His name carelessly? Thank you for your comments. Yes, it does show lack of reverence. Sad when I hear children say it because it’s such a bad habit to start. The Bible verse you refer to is the third commandment, Exodus 20:7“You shall not misuse the name of the Lord your God, for the Lord will not hold anyone guiltless who misuses his name. – Blessings! Thank you for this beautiful post! God bless your heart, mind and soul, such a blessing to read! Thank you Jesus! Michelle, thank you for reading my posts. Yes, we are to keep God’s name holy. The Bible tells us there is power in the name of Jesus, so let’s use it for healing not for hurting.